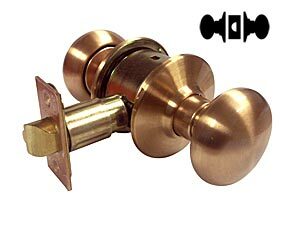 The Schlage Plymouth A-Series commercial keyed and non-keyed door knobs locks utilize the Schlage original A-Series cylindrical chassis with stylish knob designs supported by heavy duty spring cages. This design provides strength and performance in the more abrasive commercial Grade 2 applications. The Plymouth A-Series is non-handed and is available in a wide variety of keyed and non keyed functions. Passage Latch - Both knobs always unlocked.